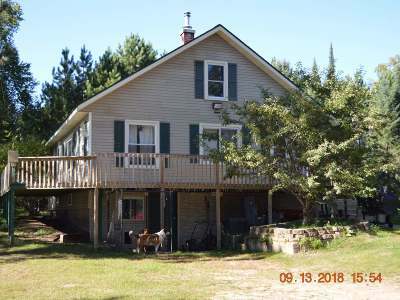 Water views without the taxes is what you&apos;ll find awaiting you at this cozy 3 bedroom, 2 bath country home. Sit on your freshly stained deck and enjoy the wildlife while the wind whispers through the pine trees and the sun dances off the water. Inside you&apos;ll find a completely updated kitchen with brand new laminate floors, cabinets, counter tops, back splash, lighting/outlets, and a new built in microwave. The living room has a cozy wood burning fireplace for those chilly evenings. The master bedroom, a 2nd bedroom and full bath complete the first level. Upstairs there&apos;s another bedroom, a bonus room and a full bath. Exposed basement, wrap around deck, newer drilled well, all situated on 5.6 acres of land. Access snowmobile and ATV trails from home! Hunt in your own backyard! Shannon Lake Hiking, Biking, Ski trail is right down the road! Don&apos;t let this one get away! Seller is completing flooring and trim work. Per seller, 3 of the neighboring homes are occupied only occasionally.